Mitochondria are structures within the cells of the body that convert oxygen and substances from the food we eat into energy. They can be thought of as the “batteries” or “energy factories” of cells. There are many conditions caused by malfunctioning mitochondria and they are given the umbrella term “mitochondrial diseases”. The common factor among these diseases is that the mitochondria are unable to generate enough energy for the cells to function well. Mitochondrial myopathy is a name given to a group of mitochondrial diseases that particularly affect muscle, but which may also affect every other part of the body including the brain and the eyes. The muscles and the brain require a lot of energy, and are therefore often the most severely affected by mitochondrial disease. Producing energy within the mitochondria is a complex, multistep process which involves about 100 different proteins. If there is a problem with any one of these proteins, the energy “production line” breaks down and consequently the cells cannot function normally. Each protein is constructed using the instructions contained within a gene (which is made of DNA). Mitochondrial myopathy occurs when there is an error (often called a “mutation”) in any of these genes. The genes causing mitochondrial myopathy are either located inside the mitochondria itself or in the control centre or “nucleus” of the cell. Mitochondria have their own small piece of DNA and some of the proteins needed for energy production are made from these instructions. However, the majority of our genetic information is contained within the chromosomes in the nucleus and the rest of the required proteins are made from these instructions and then they are imported into the mitochondria. 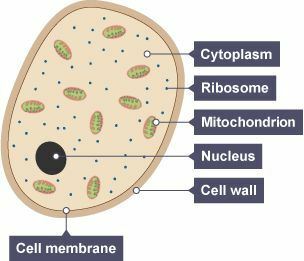 Diagram of a cell containing mitochondria. A proportion of cases of mitochondrial myopathy are not inherited from the parents. Instead changes to the mitochondrial DNA occur spontaneously after conception. This is often the case for KSS, PEO and Pearson syndrome. In other cases, mitochondrial disease is an inherited condition that runs in families. It is important to determine what type of inheritance is present, in order to predict the risk of recurrence for future children. Genetic counselling is available to help understand the risk and explore options to avoid passing on the condition. This occurs when the genetic error is in the DNA of the chromosomes, where most of our genetic material is held. 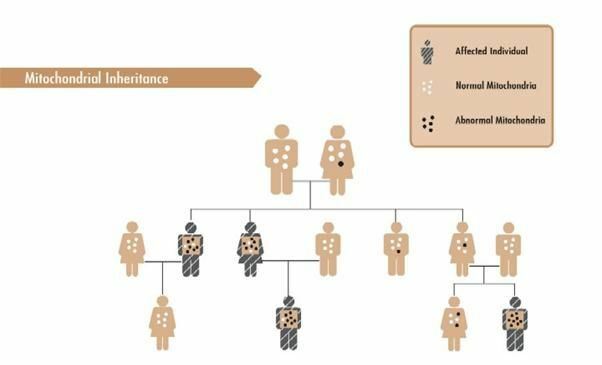 These genetic mutations are usually passed down through families affected by mitochondrial myopathy in what is known as a “recessive” pattern. In recessive inheritance an individual receives two altered genes – one from each parent. The parents of an individual with this type of mitochondrial myopathy each carry one copy of the altered gene, and are known as ‘carriers’, but they typically do not have symptoms of the condition. Their other ‘good’ copy of the gene is enough to prevent the condition developing. If both parents are carriers the likelihood of a child inheriting the condition is 25 percent, or 1 in 4. Some mitochondrial myopathies that may be subject to the rules of autosomal recessive inheritance include Leigh’s syndrome and MNGIE. This occurs when the genetic error is in the mitochondrial DNA. Children inherit their mitochondrial DNA only from their mother, because when the sperm fuses with the egg during conception, the sperm’s mitochondria is destroyed. Therefore all of the children of a woman with a mitochondrial genetic error will inherit the error, although symptoms may be more or less severe. This is because many thousands of copies of mitochondrial DNA are inherited and only a proportion of them are abnormal. The ratio of abnormal to healthy mitochondrial DNA passed from mother to child can vary dramatically and unpredictably with each pregnancy. Some mitochondrial myopathies that may be subject to the rules of maternal inheritance are MERFF, MELAS, NARP, PEO and MILS. Rarely mitochondrial disease is inherited in an X-linked or autosomal dominant pattern. For an explanation of these types of inheritance please see our glossary. A combination of chromosomal and mitochondrial errors has also been reported to cause mitochondrial myopathy, in particular myogastrointestinal encephalomyopathy (MNGIE). The symptoms of mitochondrial myopathy can range from mild to severe and people are affected in different ways, even within the same family. Many parts of the body besides the muscles may be affected. The most common problem is a combination of mild weakness of the arms and legs together with droopy eyelids (ptosis) and difficulty in moving the eyes (ophthalmoplegia). Others only have weakness of the arms and legs, which gets worse after exertion. This may be associated with nausea and headaches. Hearing loss, trouble with balance and coordination, seizures and learning deficits are common features of mitochondrial disease. Other frequent complications include impaired vision, heart defects, diabetes and stunted growth. Most affected people have some, but not necessarily all, of these problems. If the illness is severe, muscle weakness may be obvious in small babies, and they may have difficulties with swallowing and feeding. The most common mitochondrial myopathy, Chronic Progressive External Ophthalmoplegia (CPEO), is usually only a mildly disabling disorder with normal lifespan, whilst others that begin early in life are life threatening. The presence of epilepsy, heart involvement and breathing difficulties are all associated with greater risk. There is no way to predict the course of mitochondrial diseases. They may progress quickly or slowly, even over decades. The disease may also appear stable for years. How is mitochondrial myopathy diagnosed? Examination by a doctor may reveal certain features that raise the possibility of a mitochondrial myopathy, for example droopy eyelids (ptosis), or difficulty moving the eyes (ophthalmoplegia). A blood test may show a raised lactic acid level. The final diagnosis often depends on taking a muscle biopsy – where the doctor removes a small piece of muscle for further laboratory tests. Under the microscope, mitochondria from people with mitochondrial myopathies often look abnormal. It is also possible to make measurements of how well the mitochondria are functioning and identify where the defect lies. In some cases it is possible to establish the diagnosis by looking for the error in the DNA. There are no cures for mitochondrial diseases, but treatment can help reduce symptoms or delay or prevent the progression of the disease. Physiotherapy can help to maintain muscle function and muscle fatigue can be improved by regular gentle exercise. Excessive exertion should be avoided. The level of physical activity will depend on how severely the muscle is affected, but for those able to exercise, this will improve wellbeing and in some cases lead to improved muscle function. If mobility and falls are a problem, an occupational therapist can advise on the use of supportive aids such as railings, a walker, a cane, braces, or — in severe cases — a wheelchair. A good diet, including adequate vitamin intake and the avoidance of obesity are important. Regular meals with, if possible, a high proportion of carbohydrate is recommended. Illness and fasting increase the demand put on mitochondria. If regular eating becomes difficult, particularly during illness and/or if the patient is a young child, you should contact your doctor. Some people with mitochondrial myopathy experience breathing problems and require treatment with occasional or permanent ventilator support. Those with mitochondrial myopathy should watch for signs of breathing problems such as shortness of breath or morning headaches, and have their breathing checked regularly by a specialist. Regular check-ups with a cardiologist are also recommended for some people with mitochondrial myopathy as a pacemaker may be required to treat disturbances of heart rhythm. Certain drugs may affect mitochondrial function, and it is generally recommend to avoid alcohol. A few patients improve on treatment with specific vitamins such as ubiquinone, but most do not. Creatine, L-carnitine and coenzyme Q10 supplements are taken by some people with mitochondrial myopathy and report modest benefits, but there is little scientific evidence that these supplements work. It is recommended that you consult your doctor before taking any medication or supplement. Diabetes can be treated with tablets or insulin and drugs to treat seizures and headaches may be prescribed. Specialists may be required to treat vision, hearing, speech and swallowing difficulties as necessary. It is important to remember that people with mitochondrial myopathy will not encounter all of the problems listed above, but specialist help should be sought for the symptoms that do arise. Mitochondrial myopathy is a diverse group of conditions, all of which are rare, so much of the research is focusing on understanding the underlying biology causing the conditions. This is an essential step for the development of treatments. Encouragingly, drugs for some types of mitochondrial myopathy are now in the pipeline. One line of investigation is antioxidant drugs. These may be able to counteract the additional stress that is put on the cells of people with mitochondrial myopathy by the accumulation of “reactive oxygen species” which are a by-product of mitochondrial energy production. Edison Pharmaceuticals is testing in a clinical trial an antioxidant drug called EPI-743 which is designed to regulate key enzymes involved in energy production in the mitochondria. Initial trials have been promising and further trials are ongoing for people with Leigh syndrome, Pearson syndrome and other types of mitochondrial disease. The drug is also being investigated for other conditions such as Parkinson’s disease. Raptor Pharmaceutical Corp. is developing another antioxidant drug called RP103 as a potential treatment for Leigh syndrome and other mitochondrial disorders. This drug has already been approved for the treatment of a rare type of kidney disease and is being investigated for other conditions such as Huntington’s disease. Other substances that show promise include the amino acids arginine and citrulline for MELAS and the drug idebenone for MELAS and LHON. Trials are already in progress or planned. Another area of research is looking at the impact of exercise on mitochondrial myopathy because it is known that exercise increases the number of mitochondria in the cells. This could lead to an increase in energy production. This is particularly interesting in mitochondrial myopathy caused by mutations in the mitochondrial DNA because it has been suggested that the ratio of healthy to abnormal mitochondria might improve with exercise. Research is ongoing to understand more about this and discover what the best exercise regime is. Research is ongoing to develop a way to prevent the transmission of mitochondrial DNA mutations to future children. This involves new IVF techniques which are somewhat controversial because they involve the use of healthy mitochondria from a donor egg. Research is ongoing in the laboratory to refine these techniques and in the meantime regulatory authorities are considering the ethics and whether using these techniques should be permitted. Douglas S. Kerr. Review of Clinical Trials for Mitochondrial Disorders: 1997–2012. Neurotherapeutics. Apr 2013; 10(2): 307–319.